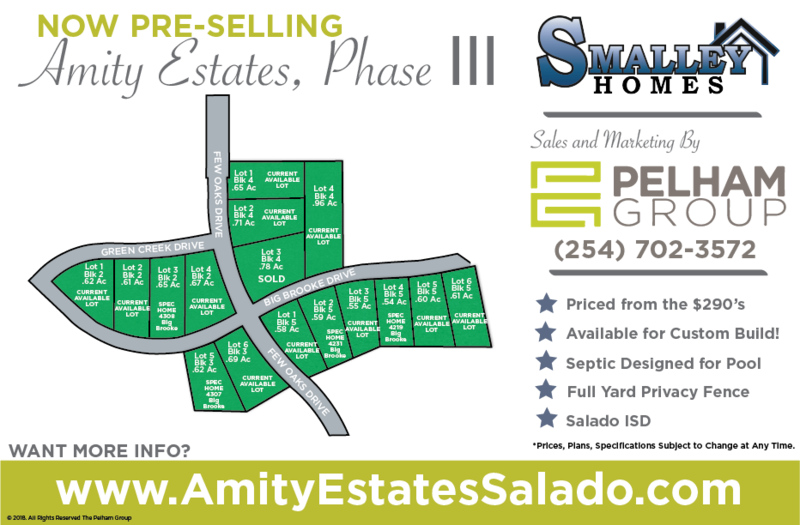 Welcome to Amity Estates in Salado, TX! The homesites in this community span a half an acre or larger allowing for space between you and your neighbors, but still close enough to let you borrow sugar, in a pinch. This community is loaded with appeal, but what makes it stand out is the esteemed Salado Independent School District, the quaint ‘Village of Salado’, and of course, the lower county tax rate. Each home is uniquely built to provide a variety of appeal and accommodate the needs of everyone, and every family. Homes are available for ‘custom build’ to suit your specific needs, as well as ‘speculative built’ for those with less time. There are a variety of features standard to the neighborhood on ‘speculative homes’ that you wouldn’t find most places. What makes these homes stand out? The thought behind day-to-day lifestyle and family-functionality is of the highest priority when designing both our Floor, and Site Plans. This very thought process ensures each home site can accommodate a Swimming Pool, Plenty of Parking, and Indoor/Outdoor Entertaining - all without compromising on finishes. *Prices, Plans, Specifications Subject to Change at Any Time. Information provided herein deemed reliable but not guaranteed.